The draft Canada 2067 learning framework is now ready for review. It is based on early input from Canadians and informed by global research. Recommendations align to six pillars – ‘how we learn’, ‘how we teach’, ‘what we learn’, ‘who’s involved’, ‘where education leads’, and ‘cross-cutting issues’. Read through the draft learning framework and answer the questions below. All students graduate with at least one senior level multi-disciplinary STEM course. The percentage of all post-secondary enrolments in STEM fields increases from the current 20% to 25%. The number of teachers teaching mathematics or science who have specialized training in each of those disciplines rise radically – for instance, from 6 per cent of Grade 4 math teachers today to the international average of 27 per cent. 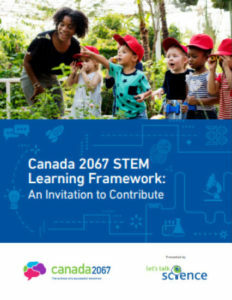 STEM industry partners align 20 per cent of their community investment goals related to education to support achievement of Canada 2067’s targets. Governments commit 1 per cent of STEM research budgets to support achievement of these targets.